User Review: "Using Anaplan at Tableau"
At Tableau, we use Anaplan for our Sales Planning function. For our company, this encompasses the functions of Workforce Planning, Territory Assignment, Compensation Plan Administration, and Quota Setting. Sales Planning was Tableau's first Anaplan use case, and since adopting the platform, we've also had use cases in Finance, Marketing, and IT. Anaplan helps us address both collaboration and version control issues. For some use cases, the key benefit is having a primary data source that can be iterated upon several times by a number of different stakeholders. For other use cases, the key benefit is having a significant number of collaborators, who can all rely on one single source of truth. Overall, Anaplan provides our company with the data integrity we need while still remaining flexible enough to update quickly to accommodate our rapidly changing environment. Storage -- Anaplan is not a data warehouse. This is understandable given data warehousing is not their primary value proposition, but many times we run close to the storage limits of Anaplan, and it would be great if Anaplan had different storage size options for its workspaces. User Interface -- Anaplan's user interface could be streamlined and improved to become more intuitive and accommodate more shortcut keys. User Review: "7 Years with Anaplan"
We use Anaplan for financial reporting, planning and customer reporting. Anaplan allows us to spend time on value added instead of spending time consolidating planning results in Excel. We can look at reviewing key trends. Forecasts are broken down into smaller tasks and distributed to the business resulting in less pressure on the FP&A team during forecast/budget rounds. The reporting timeline is shorter as dashboards can be used for users to login and see their areas results which means we dont have to send out manual reports. Anaplan allows very complex business modelling but without any of the complex language used in other tools and can be run by the users themselves. Results are recalculated on the fly with no wait time to run the recalc process. Ease of modelling. Its like Excel but simpler to use. Anaplan Review: "Great product for most, probably not for me though." We use Anaplan to set up our annual budget and do monthly projections. The model is used by 12 users in the department. Anaplan does automatically what we had to do manually using Excel in the past. This saves both time and energy for the users. Unless you're a technically-minded person, Anaplan doesn't logically make sense. It takes a lot of training and notes to learn how to use the system and can be incredibly frustrating. I often miss Excel and want to dump Anaplan for the archaic process. Anaplan seems to be geared towards the typical business with revenue and expenses, inventory, employees, etc to be tracked. Though we found a way to basically jury-rig the system to kind of work for us, it's not ideal and feels like a waste of money. However, in meeting with other users of Anaplan from non-government based businesses, they all seem to love it and it has made a world of a difference in their companies. Anaplan Review: "Excel on steroids!" Anaplan is used across the whole organization, at WW level. The key problem was to remove offline spreadsheets for sales quota planning, deployment, and ensure automatic, real-time coverage analysis for the sales teams. Real - time - the cloud based technology allows all changes & its impact is visible in real time. Performance - in the case of complex business cases, the size of Anaplan is increasing drastically, and even a simple click would take more than it should. UI - The User interface needs to be improved: group/expand hierarchy, "Ctrl " + select option to allow multi selection, Content page clean up, easier "Drag & drop" when customizing or building exports. Review & enhance the type of security user roles. Sales performance management, various finance scenarios - Anaplan is good for automating calculations. It is less appropriate for very complex business cases. "Anaplan Review from a Finance Professional in Tech"
Anaplan is still currently being used by Finance only but I can see how other departments like Sales Operations could benefit from the usage of Anaplan. 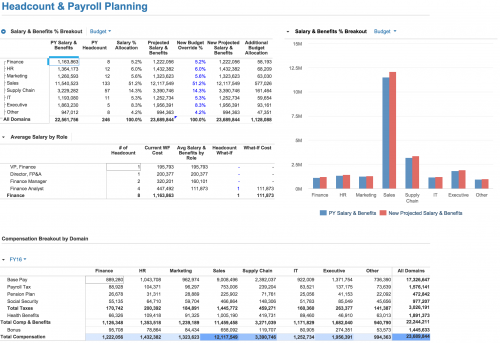 I think that Anaplan is good for workforce planning. The strength is that once you have the raw data of the personnel, one could upload the sheet for a more automated output. It is at times difficult to trouble shoot. It would be nice to have better references to the source cells. Anaplan would be great if you have a plugin to your data source. For example, if you wanted booking information sourced directly from Salesforce. As long as the raw data is correct, there is far less maintenance to arrive at the output. We use Anaplan to facilitate the management of our sales organization. From headcount to compensation planning. Anaplan is very fast! Instantaneous updates to imported information. Getting a blue-box error is the worst. If formula errors could not result in blocking other users out that would be an awesome improvement. Suited very well for planning organizations. User Review: "Anaplan, when in the right place/time"
Appropriate: financial modeling, long range planning, sales forecasting (dependent on org structure). Less appropriate: when there is no IT management support at high levels and a tight budget for going live. Review: "Anaplan for Modeling of Sales Incentives"
I purchased Anaplan to perform complex modeling of potential changes to our sales incentive programs. In addition to our usage, our finance team is beginning to explore the use of the tool for sales forecasting. With a sales organization in excess of 5000 people, it is critical to be able to adjust multiple variables across lines of business and understand the impact on each of our operating areas. Anaplan allows us to model multiple "what if" approaches simultaneously, perform side-by-side scenario analysis, and convey to our executive team what the specific tradeoffs are between options. Our responsiveness has been accelerated by orders of magnitude, and our conclusions are rooted in data. I think the greatest strength of Anaplan is that the entire model is interconnected. The ability to update a single variable and have that change propagated through the entire model is unparalleled. Another strength is the ability to have multiple users working in a given model simultaneously. We have had the experience of actively modeling to meet a deadline and realizing that some of the underlying assumptions and/or layout needed to be changed to support a new approach. While our model-builder made the back-end adjustments in Florida, our analyst continued to work through a new set of variables. We ended up with a completely refreshed approach in less than a half hour. With only two hours before our deadline, we NEVER would have even entertained making the change in Excel. The thing that Anaplan does -- that I haven't seen elsewhere -- is the ability to get to data-driven analysis of the future. BI tools are great for reporting what has already happened, but fall short of predictive analytics and sensitivity analysis. Anaplan handles those with ease. The reporting/dashboarding capability is adequate but could be enhanced. Anaplan is somewhat intuitive ... but it DOES require an investment of time and energy to become proficient in it. The ability to use it for more and more use cases is limited by the number of personnel who truly understand the tool. The corollary is that unless that knowledge is spread to multiple people on the team, there can be substantial risk were a key resource to leave the group. Building a new model does require a fair amount of up-front planning and construction. So there are some things we would rather do in Anaplan than Excel ... but unless they have continuing utility, we find ourselves unlikely to perform quick analyses in Anaplan. To date, I have used Anaplan for sales comp modeling, territory and quota planning, and sales forecasting. It has been well-suited to all three. The corp FP&A team is using it for financial budgets. The revenue planning team is using it for revenue planning. One of our units is using it for demand planning. The customer service org is using it for returns modeling. It's primarily a finance footprint but that footprint is growing outside finance. The actions could be improved - make it obvious what the sources and targets of the are so we don't have to guess or put them in the action names. Also get a native scheduler! That's so simple and it's very frustrating and expensive to have to build/buy our own. Reporting and UI still have a long way to go. Simple things like being able to alphabetize/order what you see on the screen, or add a rich color pallet to choose from. User access management could improve. We need to have model level admins that don't have access to everything in the workspace. Also the tenant admin space doesn't work effectively. I can't remove a user from all models simultaneously. I also can't see all models a user has access to from the tenant admin space. It's great for complex models that require frequent updates and instant feedback. That describes most planning situations I know of. It's great for organizations that want to change plans and models independent of IT support or programming. It's not a great reporting or analytics tool. Ad-hoc analysis is a non-starter in the platform--you have to be a model builder and the process of generating a report is very cumbersome compared with something like Tableau. We have two Anaplan instances. Sales Ops uses it to manage headcount and for capacity planning. They have users and viewers of their headcount reporting. I manage the FP&A instance which is used to plan headcount, expenses, capex, and COGS. We also use it for reporting for various cuts of the P&L, headcount, and balance sheet. This instance is only being used by FP&A, but we hope to role it out to business partners later in the year. Anaplan is great for headcount reporting. We have reports by dept, office location, and subsidiary that is great for planning and also for full company reporting. Although they can be complicated to set up, Anaplan is also great for setting up complex P&L views. For example, setting up a P&L with a combination of subs/depts., that still needs to consolidate to the total P&L. Systems-wise, I like that it's impossible to #REF the model! Anaplan shows you where everything is referenced, so it's very difficult to break anything. 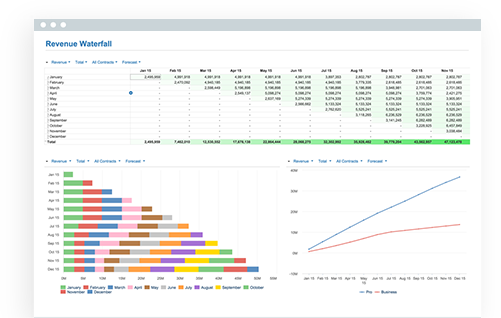 Anaplan is great for Sales Ops, FP&A, and basically anything that is heavy Excel-based. It's great at summarizing large amounts of data, like pivot tables. It's also great for crunching Salesforce data. I don't have a need for SQL, but I'm sure it would great for any kind of database summarization use case. Currently we are using Anaplan for Planning and Budgeting. We are looking to begin using it for a forecasting and consolidation of data (Data Hub) and performance reporting models. The main business problem it has helped us with is the consolidation and ability to report on multiple dynamic hierarchies across a wide range of businesses. It has also being the driving force for process change within our organization. We really like the Data Hub concept. We are working on multiple projects with regards to aggregating data from multiple sources, and Data Hub has worked well for us thus far. Agility is key for our businesses and we feel that Anaplan gives us the ability to remain flexible and reactive to the changes throughout our businesses. 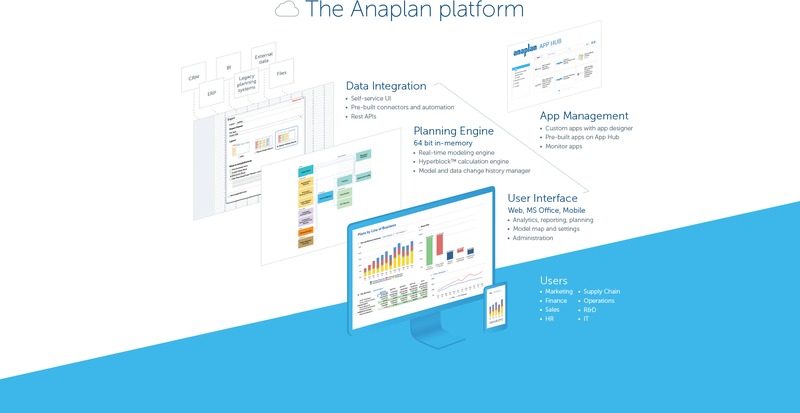 As a administrator I really like the resources provided by Anaplan such as Anapedia. It makes it really simple to ask questions and find answers if we are having difficulty with certain items. I believe user set up within Anaplan is one of the areas that could be improved greatly. Workflow is another area that I believe could be improved. Currently, I do not believe, there is a way to create an action against workflow. This would be a great benefit rather than moving the item to complete or in progress if you could write an action for it. We are really excited and looking forward to exploring the forecasting, and "What If" scenarios. Our current business structure makes it very difficult to forecast and project at any level, and I think Anaplan will be a great solution for us. I think for any business that has multiple, or dynamic, hierarchies Anaplan is a great solution. We have reduced the time spent on these dynamic views by using subsets and properties with in the models. I am looking forward to the increased the communication/connected planning aspect that Anaplan brings to our company. In the past we had thousands of Excel workbooks, some that were too large to email or open. We have seen improved interaction and clear lines of communication for our end users by using Anaplan for our budget process. User Review: "Doing it all with Anaplan"
We currently use Anaplan for FP&A - essentially having modeled out entire business on the platform. We use it in most all planning and forecasting discussions. Because of its flexibility, ease of use and ability to scenario test, it allows us to quickly and accurately make decisions that have a financial impact that would otherwise take days or weeks to make. 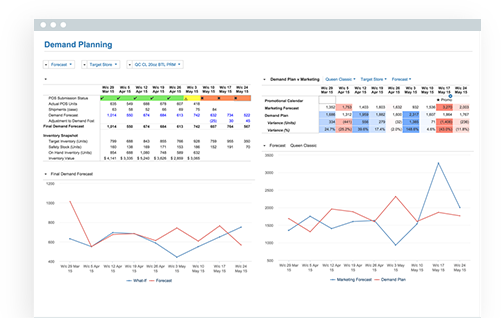 We are currently in the process of rolling out Anaplan for sales forecasting to increase accuracy and accountability in our sales forecasts. 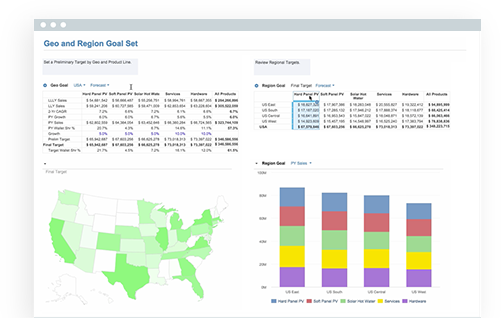 Lastly, we are in the early stages of planning to use Anaplan for our business intelligence reporting capabilities. It will be used as our one source of truth for business metrics and results - something we desperately need and that Anaplan will work perfectly for. Modeling is next level in Anaplan. With a background deep in Excel modeling and the frustrations that come along with it, Anaplan is a breath of fresh air and is actually fun to build and model in. Dashboarding and synchronization. The synchronization feature in Anaplan is one of the greatest things ever. As its core Anaplan models are built around hierarchical lists and dimensions and using similar dimensions in dashboards allows you to synchronize to different views of the same data with simple clicks around a dashboard. It makes reporting and BI extremely user friendly and flexible. Its fast. If you had the same exact model in Excel and Anaplan. That model in Excel would be like riding and old bike with under-inflated tires, while Anaplan would be like driving a Tesla in Ludicrous mode. The ability to have your entire business modeled on a single platform, potentially across multiple models, where when you make a change the entire model updates within seconds, is invaluable in making decisions. Error handling can be annoying. A single formula error can lock up your model for 2-5 minutes while it reverts back to before you pressed enter, and while its improved a little in the year I've been using Anaplan, there are certain situations where I feel like it could be eliminated or made more efficient. Time subsets would be really nice. Anaplan is great for modeling processes that are ongoing, and remain relatively the same over time. In other words, if you don't have a solid grasp of your process, or you know there are significant changes that change the way you do things on a not infrequent basis, you may want to wait to build the model in Anaplan until things are more stable or you have a better understanding of the business requirements of what you are trying to build. Wholesale changes to an Anaplan model can be cumbersome and time consuming - though that is not unlike modeling on any other platform. It's also probably not worth your time to build a model in Anaplan if you're only going to use it once - in this case, if it's not too complicated, Excel is probably a better choice. Review: "Anaplan - a powerful flexible tool with nearly endless potential"
Our road map is to implement Anaplan globally to connect all departments and all levels of the organization for end to end planning, management reporting and analysis. Our initial phases focused on seamlessly connecting orders reporting and forecasting to revenue and gross margin forecasting. Anaplan allows all levels of the organization to have one version of the data and was the catalyst for rolling out consistent forecasting processes across all regions and functions. Anaplan will bring efficiency to our organization by eliminating shadow finance activities, improving data integrity and allowing consistent on demand analytics. Review: "Anaplan: The "do we still have an IT department?" tool"
We currently use Anaplan as a quota and territory management tool focused around our yearly target process. As of right now we only use it for the US business unit. However we are looking to expand this use case to Canada as well. Our goal is to then add additional use cases such as Compensation and pipeline/forecasting. Allows non-technical business-oriented individuals create functionality in the system. Excellent business partner from a people perspective. Very focused on customer success, not just the next PO. Ongoing support contracts based on LOE. Better formula support and explanation within the model. Anaplan continues to provide us a platform to solve business problems that would otherwise get overlooked. The ability to create a data hub that can easily integrate with legacy systems and act as a staging ground for manipulating the data for multiple business problems is invaluable. Couple this with the ease of access and decreased reliance on IT makes this a very nimble and effective tool. User Review: "Anaplan Modeling on HR"
Right now, we are using Anaplan for workforce planning modeling. We use the historic attrition and internal movement data to forecast future hiring needs. It seems that other functions in my company are exploring Anaplan but as of now only HR has implemented two models using Anaplan. Smart Import Features: When you have data in multiple dimensions, as long as you set up the corresponding fields correctly, it can be loaded into your Anaplan space fairly easily. Interactive Dashboard: As long as you set up hierarchy correctly, you can publish your numbers on the dashboard and just navigate to the level that you are interested in. Productivity: My favorite thing about Anaplan is that you can work on the formulas on a micro level (in my case, individual employee) and you only work on this once and it will apply to the whole and you can have the company view in no time. Doing the same thing in MS Excel could take much longer. Graphical feature: Anaplan should explore more graphical features. In my case, I have to export my data to MS Visio to get an org chart. The conditional formatting options are still very limited right now. Formula for List Properties: It's only allowed to key in the formulas for these list properties. I'm not sure about the design philosophy. But I wish it could be similar to the formulas in modules to avoid mistakes. Training Documentation Version Control: Training documentations have some many mistakes. It seems no version control at all. Since using Anaplan requires to set up time properly, the training documentations need to be updated. Before you publish any document, can you let one of your employees (who are not authors of the documentation) to follow the documentation to see if he can complete tasks based on the directions on the documentation? All the modeler in my company had hard time to teach ourselves by using the documentation so none of us was able to complete the intermediate training. It makes sense for HR to use Anaplan to adapt to the ever-changing org structures. Anaplan Review: "Easier Territory Planning"
Currently we are using Anaplan for account ownership and territory planning. We are about to role out Anaplan for incentive compensation. Our current use saves us tons of time from our Excel planning and allows us to see the impact of proposed changes without trying to manipulate a large Excel file and worry about version control. An additional benefit from our implementation is quick and easy reporting on account ownership. Having incentive compensation in Anaplan will allow us to integrate the two instances and see the impact of account moves to compensation and vice versa see the impact to sales reps pay based on their books of potential compensation changes. Anaplan is great for moving large data sets out of Excel for analysis. It is great for scenario planning. User Review: "Anaplan - Beginning Stages"
We use Anaplan to sync our data across demand and supply and then layer our financial assumptions to build out our financial forecast. Anaplan addresses business needs of synchronized, timely data tied to one source of truth, as well as scalability within the organization. Also relevant is the fact that it can refresh in seconds what would take Excel days or weeks to complete. The ability to build cube logic is great for financials requiring build outs of multiple SKUs, reorgs, etc. Anaplan is great if you are building out models reliant on large, complex data sets that are refreshed constantly and that expand or contract often. Oftentimes I've also seen it being used as a place to build out long range planning or similar exercises based on complex functions -- in that case I'd actually recommend Excel. Anaplan is truly used best when scaling large, inconsistently sized data sets across organizations. Anaplan Review: "Dish Network leading the way in Supply Chain Planning"
It is currently used by supply chain planning for planning repair parts. It helps in transparency and measuring performance which helps maintain desired inventory levels. It allows users to set up complex algorithms which then leads to recommendations made by the tool for the planners to make a decision. Helps in collaboration across multiple users within our department but across Dish and potentially externally with our suppliers in the future. The software is extremely fast and can calculate scenarios fast. Partnership with data visualization software such as Tableau is needed. More supply chain apps to allow users to see the different applications within supply chain. Anaplan is a useful in aggregating data but powerful as it can use complex calculations to help the user make decisions for multiple variables. It is not a data visualization tool - dashboards are clunky as such users should try to use Anaplan with another tool to dashboard data. Anaplan Review: "Get your Forecast out of EXCEL!" We use Anaplan within our FP&A oOrganization. The goal is to get to make this a robust tool and also have our deal desk be linked into the system to help with synergies. Currently, FP&A is the only team using the tool in the organization. The problem that Anaplan helps us address is getting out of Excel and being able to have a single place for our forecast to be held. It allows for us to lock our forecast, which is extremely important for a public company. It's an extremely collaborative tool, allowing multiple users on a team to update the forecast, without fear of breaking the system. It is easy for a finance person to understand the formulas and update them as the business changes. Error Messages. When updating a formula, you may have missed a bracket. Doing something like this can lock up the system for an extensive amount of time, also locking out your peers. Suppressing Zero. Space becomes a real issue as you get more involved in the tool. A lot of times you want to use the system to its full capability, however, run into problems, because of space. It would be great if zero balances did not count against your space. Open source: Because the tool is so open, you can change something in on module, however effect many other things that you never intended too. I would love to see a feature that shows me by changing something a clear picture of all thing i am updating. I think the tool is well suited for any organization that wants better insight into their finances. I think compared to any other SaaS tool out on the market the clear leader is Anaplan. I have used and implemented Adaptive in prior companies and while the tool is functional, you can see its limitations. Anaplan Review: "First-Time User's Pros and Cons"
Anaplan is used primarily within finance and strategy for financial planning and analytical purposes. It provides the team with the capability to merge and work with operational data sourced from multiple systems into one world. Thus, not only are we able to dissect data with greater dexterity, we are able to utilize multi-disciplinary data in conjunction with Anaplan's forecasting models to plan with greater precision. Personnel Forecasting models allow more in-depth & precise forecasting. Flexibility allows the creation and use of custom, better focused analytical and planning models. The tool is geared towards mass usability within an organization, thus can be used collaboratively between finance and business partners. Size and pricing limitations inhibit full potential of the tool. Empty cells/cells with 0 value are counted and take up space in models. Models often require sophistication that can be a challenge to implement. Forecasting with the tool is particularly well-suited if the appropriate model is built and available (i.e. personnel). Scenarios where it is less suited might be those that require custom, sophisticated models. Although flexibility is a key advantage of Anaplan, capitalizing on this advantage isn't always pragmatic. Often, building a model requires the investment of time to build, test, and fine-tune a solution. That time requirement might not be as affordable for a smaller team. Anaplan Review: "Make your life easier - but have to put in the hard work upfront"
1. Sales Finance - Anaplan was used for weekly forecast process and I was part of the team that implemented Anaplan. 2. Business Strategy and Marketing Team - I implemented Anaplan for this team for our annual target setting. Both experiences had positive outcomes and each model was implemented and currently being used. If the model in Anaplan is built well, it allows the user to make one change as part of an input and that one change will be reflected through out the model. Unlike Excel, there is no need for a formula check - it's a very useful feature for a large model for multiple variable and drivers. The key to a successful model is to keep your model simple, don't overcomplicate things. So far, I've been pleased with Anaplan. Where Anaplan, as a company can improve, is the consultants. Different consultants have different styles and Anaplan Consultants should be teaching their customers how to use the tool rather than doing the work on their behalf. Also, most of the consultants I interacted with were from LA so it would be nice to have some local consultants (Bay Area) or at least have some face to face time with our consultants. For our purposes of weekly forecasts and target setting, Anaplan is well suited. I took a target setting Excel model, that is about 20 tabs or more, and converted it into Anaplan model. It usually took the team about 2 or 3 days to make a few simple adjustments to the target setting Excel model, whereas I made the same adjustments in Anaplan and it took me about an hour or two. So there is tremendous time saving, but that's if the model has been built well in Anaplan. User Review: "Anaplan is Changing business"
Currently, Anaplan is being used to calculate incentive compensation and workforce management. It is being used to replace slow legacy and Excel systems. It is also being used as a data hub for current and future use cases. it is a powerful calculation engine. It allows you to analyze data instead of [just] prepare it. Saving of different user views of dashboards. I wish it would handle custom time frames better. I think anaplan is perfect for forecasting financial scenarios. User Review: "Anaplanning with confidence"
Anaplan is currently used as our annual budgeting and monthly forecasting tool. The budget owners are given access to view their respective department budget. We also use the Anaplan Excel add-in function to help with the reporting aspects. Anaplan has reduced the planning/forecasting turn around time; increased efficiency, and most importantly data integrity (vs. previously done in Excel). It also provides visibility of the detail behind the budget/forecast. For FP&A - Anaplan helped streamline the budget and forecast process. Build robust financial model and improve efficiency, accuracy, and reliability. Review: "Anaplan beats Excel for complex modeling"
We use Anaplan as a free-form modeling platform. It is an alternative to our old Excel based models. We are leveraging its ability to calculate massive amounts of data in a highly structured yet flexible model. It is currently being used to forecast future medical and drug claims to arrive at the total monthly premiums charged to our customers for the Retail ACA lines of business. We are currently building prototypes internally and looking to expand to other use cases. Cloud based modeling platform that can be accessed from anywhere with leading industry-standard encryption and security. Speed and Power of Hyperblock calculation engine. It can calculate an enormous amount of data, an amount that excel would have no chance at processing. Does the model have a very large number of calculations or massive amounts of data? A quantity that would be difficult to process in Excel or its current platform? Does the project require collaboration or input from many different users? Is the problem complex enough to require a more sophisticated and highly structured modeling tool? If the answer if yes to all of the above then Anaplan is likely a good choice. Anaplan Review: "Excel Spreadsheets & Charts without the Capability of Excel"
We use Anaplan within sales ops and across our sales teams for territory planning. It is used by 3 members of our sales operations team, 5 region leads, and 15 team leads. We use it for "What-if" analysis in territory design. It allows reps to be able to see the impact of changes before they actually happen. Territory planning would be the ideal use case here, but Anaplan lacks basic Excel functionality. You need to choose one sorting option for all of your graphs, you can't change the color or theme of the display pages, and it is not intuitive to use. If you need speed, it can handle that, but be prepared to give up a lot of capabilities. Anaplan aims to be the leader in Connected Planning. According to the vendor, the software—powered by their patented Hyperblock engine—enables dynamic, collaborative, and intelligent planning. Large and fast-growing companies worldwide use Anaplan to connect the people and data required for trusted plans and accelerated decisions essential to leading in their markets. The company is based in San Francisco, and is privately held with 20 offices, 175 expert partners, and more than 850 customers worldwide. Platform - Align business investment to corporate and departmental goals. Gain control over IT projects and reduce time and cost overruns. Easily manage IT shared service costs and allocations. Quickly report progress and impact to the business with live scorecards. Continuously optimize teams and priorities to deliver the most relevant value.Finance - Put structure, speed, consistency, collaboration, and accuracy into your financial planning process.Supply Chain - Reduce end-to-end supply chain costs and profitably align your supply chain to market opportunities.Sales - Get your sales plans right—and keep them right to strategize, align, and optimize sales performance.Workforce - Anaplan helps your organization marry bottom-up operational workforce plans with your strategic plans, connecting your current workforce strategies with your global hiring plans. It all connects.Marketing - Anaplan helps marketers eliminate spreadsheets to drive efficiency across planning, production, execution, and measurement. 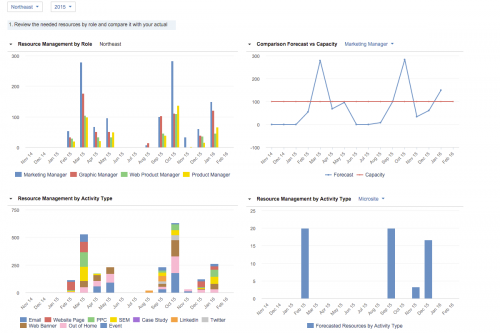 Build in team capacity and manage resources against planned activity and availability.